Today's Draw: Queen of Cups from the Tarot of the Sevenfold Mystery in the Unconscious Desires position from the Deck of 1000 Spreads. When it comes to things like God and love, would you rather know all the answers? Is your hope in contemplating the mysteries of life that you may one day light upon an answer? Or is the mystery more valuable than any answer could ever be? 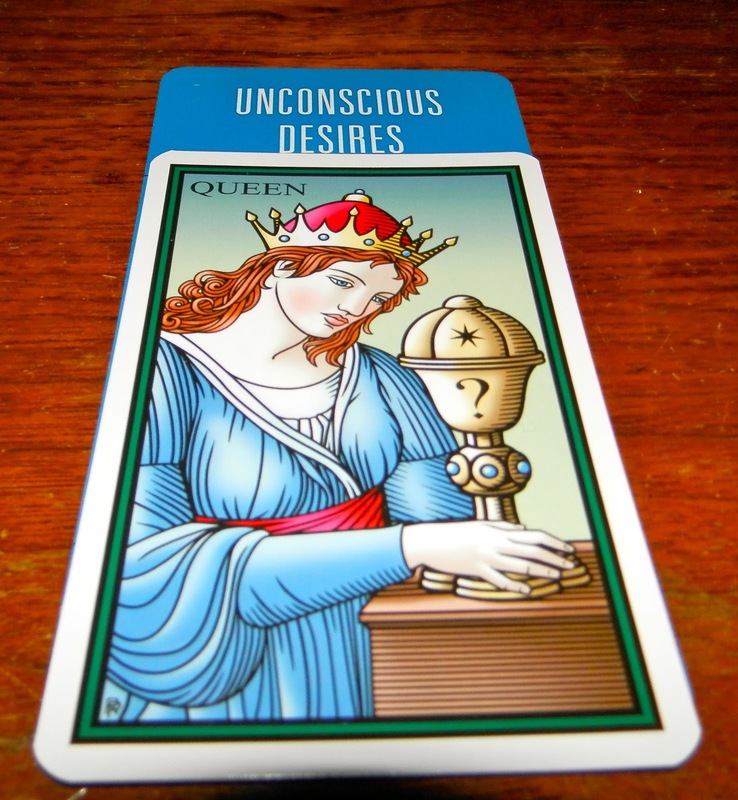 The Queen of Cups thoughtfully contemplates a mysterious cup. Yet she's not opening it up to see what's inside. Could it be that some things are better left a mystery? 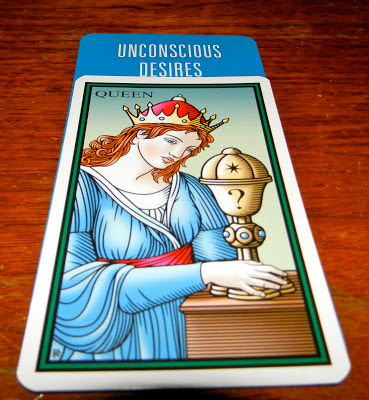 When this card falls in the Unconscious Conscious desires position in a spread, that could very well be the case. What immediately occurred to me is our spiritual beliefs. They're better left a mystery, I think. With mysteries, all possibilities are possible. There's room for magic. And if there's one thing I like to make room for in my life, it's magic. So consider if there were no mystery or interpretation left in the Bible, for instance. It really is the word of God. It really was told exactly as God told it. It is a completely unbiased accounting history. There is only one way to interpret it. And everything within it is indisputable. So there is only one religion. Only one way of seeing God and his law. No mystery. No questions. No magic. Wouldn't God and religion lose some of its zest and awe? Isn't it the questions and all the possible answers that keep us searching throughout the millennia? Isn't it the searching that gives God his superawesomeness? The same is true of the cosmos. What is there to look up and wonder about if you have all the answers about the millions of galaxies and life on other planets? And love....where is the juicy excitement if you know before you even meet someone what role they'll play in your life? And life...consider all the things you might never attempt if you were born knowing all about how it were going to go. It's funny how much time we spend contemplating the answers of things that are better left a mystery. Though there is great drama, magic and possibility in that contemplation. If the Queen leaves the vessel closed, it could be filled with diamonds, chocolates or even a fairyland of delightful little ponies...anything! But if she opens it to find dust—or even gold—all the magic goes away. The mystery itself is worth more than a vessel full of gold. Perhaps the Queen is wise enough to know that. And so she will continue to ponder and dream.